Where were we? 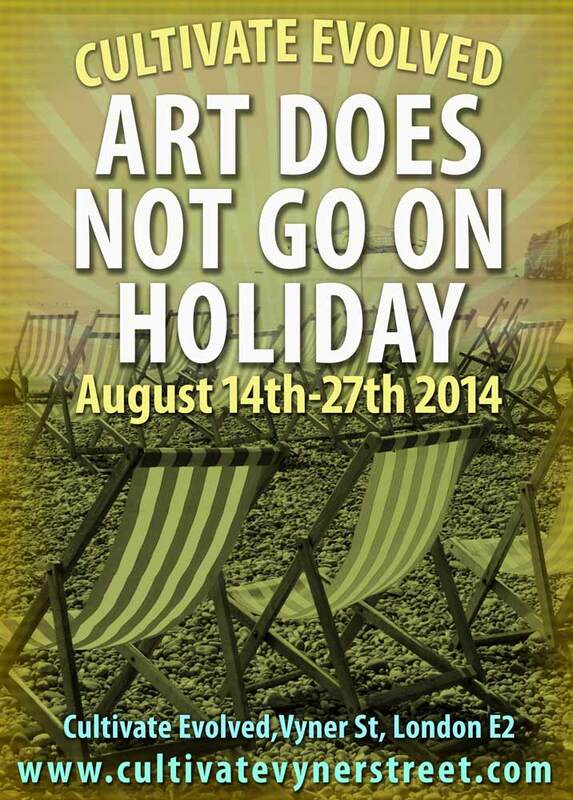 Not on holiday, that’s for sure, art does not go on holiday. Art Does Not Go On Holiday is our current show at Cultivate Evolved, it is in part a tongue in cheek dig at those more formal galleries that seem to delight in closing down and heading off on vacation right when people are over here on holiday and want to spend some time exploring art…. .or maybe it wasn’t so tongue in cheek? Nothing is ever tongue in cheek around here and I’m not sure how many times I’ve apologised to frustrated guide-book-clutching people on behalf of the other galleries in the street over the last few weeks. had a really disappointed couple from Japan in Cultivate this Sunday, had a women from somewhere in the suburbs (I assume) raging at me about it earlier in the day, pretty much blaming us for the folly of others…. Art Does Not Take a Holiday opened last Thursday evening, and will occupy one wall of Cultivate until the 27th August. ..We’re outside in the street with our deck chairs and sticks of rock, artists not on holiday have been invited to come get involved, we’ve selected the art from the pieces submitted and we’ve invite artists who are off on holiday to send us their post cards…. Here’s how things are looking at the art chute that is Cultivate Evolved right now, do come spend some of your holiday time exploring it…. And while we’re here and you’re flicking through the holidays slides, here’s a taste of August First Thursday, featuring EMMA HARVEY, QUIET BRITISH ACCENT, JULIA MADDISON, M.O.B, SEAN WORRALL, ZOE CROSSE, MATHEW TUDOR plus special guests PETER D’ALESSANDRI , BEX MASSEY and TESS WILLIAMS. ← WE ARE THREE….. September First Thursday at Cultivate, three years on from the naked red men and…..